In one of the most unusual and eclectic musical team-ups in contemporary punk-rock, German outsider artist Klaus Beyer, infamous worldwide for his off-beat, lo-fi, cover versions of Beatles classics, (often utilizing the original music track), now sets his sights—and sounds—on inimitably crooning adapted German language lyrics to the punk-pop stylings of NYC’s Osaka Popstar. 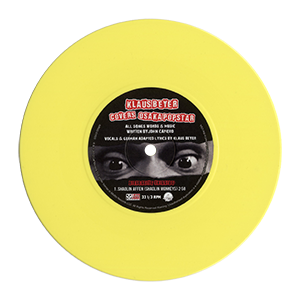 Pressed in a physical edition limited to 1,000 7-inch EPs worldwide, the blind assortment offers a 50/50 chance at finding a “Monkey-brown” or “Banana-yellow” vinyl record inside. 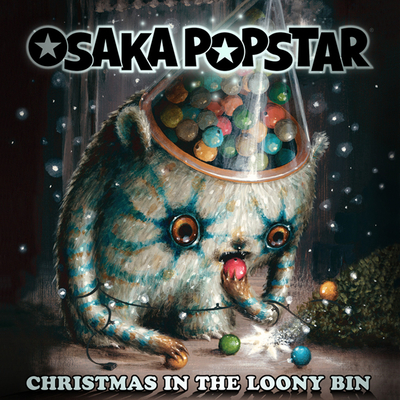 All orders at the Misfits Records Online Store, or the Osaka Popstar Online Store can specify the color of their choice, AND at a price below you’ll find in stores! 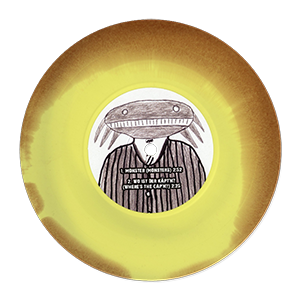 Also available for purchase is the ultra limited “Monkey/Banana Mash-Up”, a brown/yellow transitional vinyl blend. ONLY 100 pcs worldwide! 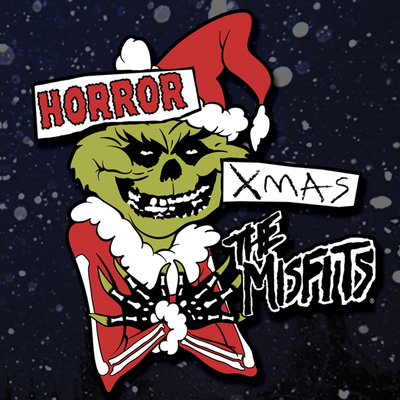 Not sold in stores, order exclusively from the Misfits Records Online Store, or the Osaka Popstar Online Store —while supplies last! Those who find themselves quickly endeared to the cult of Klaus Beyer join a discerning fan base that includes Osaka Popstar’s John Cafiero himself, and the likes of Sonic Youth’s Thurston Moore. The same lo-fi techniques applied to Beyer’s 13 year mission of covering the entire Beatles catalog stands true to form. Utilizing the original instrumental music beds of “Osaka Popstar & the American Legends of Punk” (featuring guest appearances in the backing band by members of the Misfits, Ramones, Black Flag, & more), Beyer delivers an oddly appealing & wholly unusual vocal performance sure to please fans of his eccentric Beatles work, the “Adult Swim” generation, & those with an appreciation for the truly unusual. Title track “Shaolin Affen” even boasts a music video shot on Super 8 film by notorious cult director Jörg Buttgereit (Nekromantik, Der Todesking, Captain Berlin vs. Hitler), transforming 60-year-old Beyer into an 80’s punk. The video & the EP itself was produced in association with Frank Behnke, former Mutter guitarist, and documentary filmmaker whose credits include the making of David Lynch’s film “Blue Velvet”. Beyer’s work isn’t limited to any single form of media either. His visual artistry, (sold & exhibited in galleries worldwide), materializes here in the form of original illustrations representing the songs on the EP’s sleeve art. These illustrations interact with photos by Behnke and Buttgereit, to visualize the surreal world of Klaus Beyer and “Die Shaolin Affen” EP. 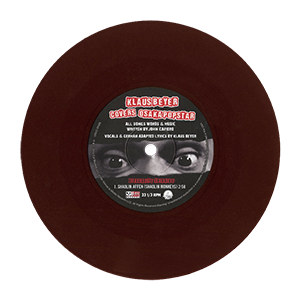 Order individually, or pick up all three vinyl coloways. During its initial release summer 2012, an Autographed Collector’s set including all three vinyl colorways + a signed 5″ x 7″ color, glossy art-card, (suitable for framing) autographed by Klaus Beyer, John Cafiero (Osaka Popstar), Jörg Buttgereit (Director of the “Shaolin Affen” music video, “Nekromantik” & more), and Frank Behnke (Producer & ex-Mutter guitarist) was available while supplies lasted in the Misfits Records and Osaka Popstar Online Stores. 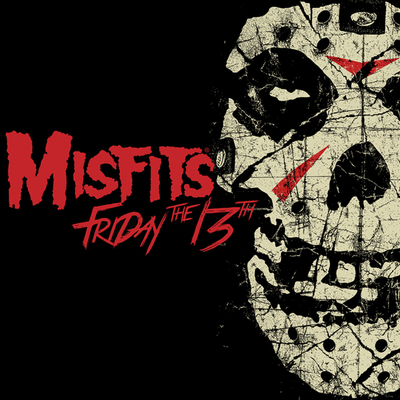 All purchases for the “Die Shaolin Affen EP” 7-Inch from the Misfits Records and Osaka Popstar Online Shops include instant MP3 download of all three tracks on the EP. CLICK HERE for more details on this release. 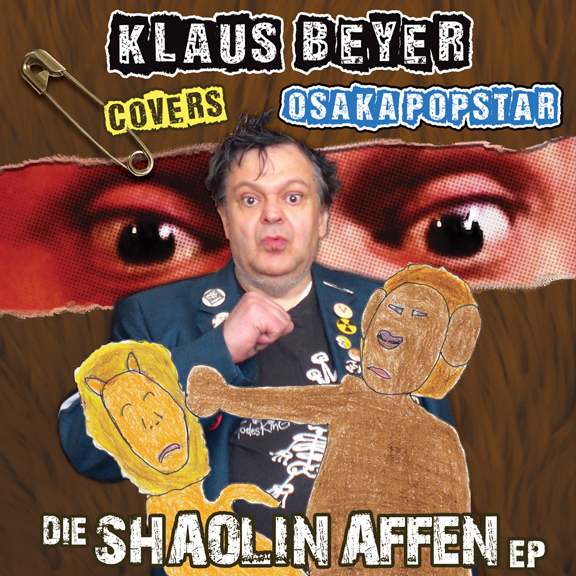 Cult director Jörg Buttgereit’s “Monsters of Arthouse” limited edition DVD’s bonus extras include the music video for “Shaolin Affen” from the Klaus Beyer Covers Osaka Popstar EP. The “Monsters of Arthouse” DVD is available throughout Europe from Media Target or elsewhere wherever imports are sold. The disc is PAL region free in German language with English subtitles.